search for an element that will help harness the power of aether. ~Excerpt~The train slowed and rolled into a coal yard in a deserted area. Iris thought she saw some hints of blue in the gray-brown haze above the train, but she had no desire to go outside. Then she observed something very strange—the maid and the men who must be conducting and fueling the train walking around with long-handled hand-looking devices and looking on and under their cars. The men also had long-barreled steam rifles, which from the glow on the handles had been turned on and primed long enough ago to be ready for immediate use. “What are they doing?” Professor Bailey asked. “I don’t know.” Iris tried to angle herself to get a closer look at the proceedings, but she bumped her head on the window and rubbed her forehead. A thunk and other sounds above her told her someone climbed on the roof and walked across it. The crack of a steam rifle made her jump. More rifle shots made them all duck and cower below the window line so as not to be easy targets. Iris found her head cradled against Professor Bailey’s chest, which felt broader and stronger than she had estimated. “Miss McTavish, your hair is tickling my nose,” he said. “I can hear you, you know,” Bledsoe grumbled from somewhere near Iris’s bustle, and she became aware of the weight of his head on her hip. After about twenty minutes of awkward silence during which Iris heard people moving around outside and a few more shots, the train moved forward again. Something crunched under the wheels. raised when she caught sight of the three of them on the floor. “Certainly not.” Iris scrambled back onto the bench she had been sitting on, and the men did likewise. She narrowed her eyes at the maid, who looked like she tried not to laugh at them. “What were you doing?” Iris asked. Both of the men looked at her, and she guessed they were irritated by her speaking first. It was bad enough her reputation would be at risk for traveling with the two of them unchaperoned, she didn’t need to be caught in any compromising positions. Therefore, she needed an explanation to put the situation in context. “How do they work?” Professor Bailey asked. Cecilia Dominic wrote her first story when she was two years old and has always had a much more interesting life inside her head than outside of it. She became a clinical psychologist because she’s fascinated by people and their stories, but she couldn’t stop writing fiction. The first draft of her dissertation, while not fiction, was still criticized by her major professor for being written in too entertaining a style. She made it through graduate school and got her PhD, started her own practice, and by day, she helps people cure their insomnia without using medication. By night, she blogs about wine and writes fiction she hopes will keep her readers turning the pages all night. Yes, she recognizes the conflict of interest between her two careers, so she writes and blogs under a pen name. She lives in Atlanta, Georgia with one husband and two cats, which, she’s been told, is a good number of each. She also enjoys putting her psychological expertise to good use helping other authors through her Characters on the Couch blog post series. ebook formats from Samhain Publishing. Cecilia is giving away two prizes during her tour. 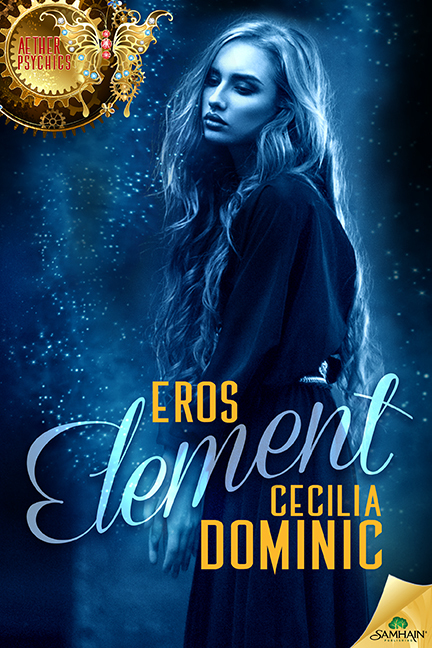 Prize #1 is a $25.00 Amazon GC and Prize #2 is a signed copy of Eros Element. For a chance to win these Prizes please fill out the rafflecopter below.